Nebuchadnezzar II, a king with issues. With Halloween upon us, I thought I’d write about Nebuchadnezzar II, the great king of Babylon, the one known for building one of the most elusive wonders of the ancient world. King Nebuchadnezzar was a werewolf! 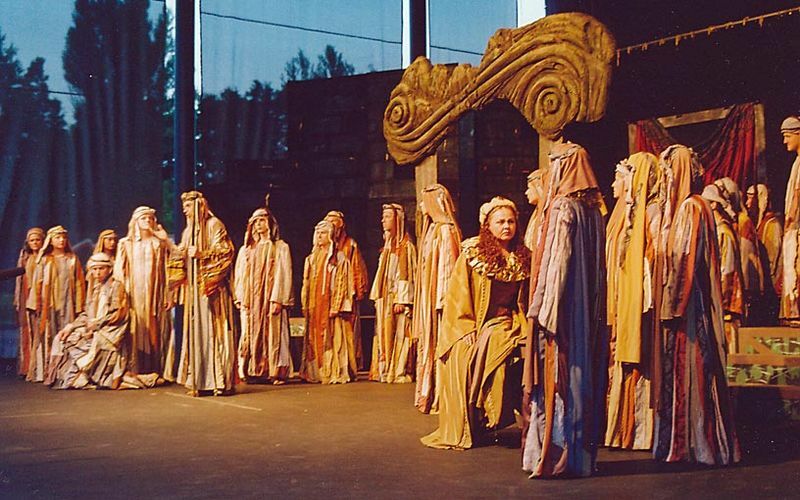 King Nebuchadnezzar at kind of a bad moment. 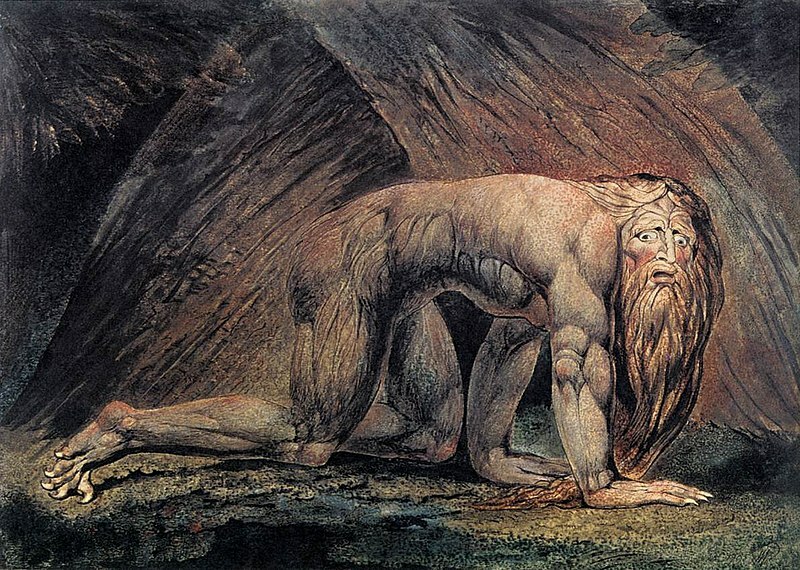 In my research to put this post together, I found all kinds of sources referring to Nebuchadnezzar as the first–and I assume only–biblical werewolf. It is through the bible that we are introduced to this part of Nebuchadnezzar’s eventful life and reign as the king of the Neo-Babylonian Empire, also known as the Chaldean Empire. Born around 634 BC, Nebuchadnezzar II was the son of Nabopolassar, the liberator king of Babylonia after three centuries under Assyrian rule. King Nabopolassar left his son plenty to work with when he died around 605 BC, including political stability and wealth with which to expand and strengthen the empire he built, and Nebuchadnezzar’s ambition helped him build upon his father’s accomplishments. Nebuchadnezzar began his journey to greatness by marrying Amytis, the daughter of the Median king Cyaxerxes, securing an alliance with his father’s allies against the Assyrians, the Medes. He then went on to defeat the Assyrians as well as the Egyptians, and became the first Babylonian king to rule Egypt. He also brought the regions of Palestine and Syria under his rule, and in turn controlled all trade routes stretching across Mesopotamia, from the Arabian Gulf to the Mediterranean Sea. A panoramic view of the reconstructed city of Babylon. Note the thickness of the walls. Nebuchadnezzar II is also credited with building what the Greek historian Herodotus (484 BC-425 BC) felt should have been included in the list of Seven Wonders–the walls of Babylon, which were 56 miles long according to the Ancient History Encyclopedia (another source says 10 miles), and so thick that chariot races were performed on top of them, along with the most famous entrance, the Ishtar Gate. 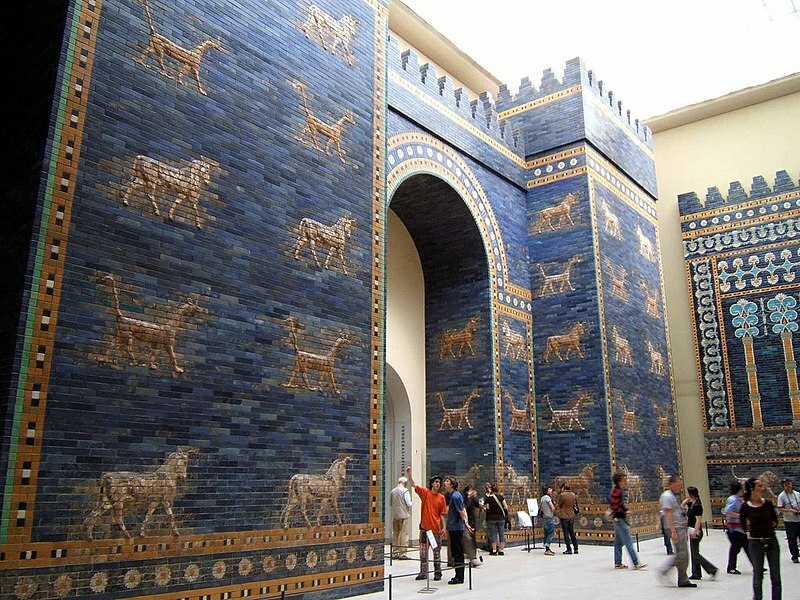 Under Nebuchadnezzar’s rule, Babylon flourished as the center of art and literacy. Mathematics and craftsmanship also flourished then, along with religious tolerance and interest in other faiths and gods. Nebuchadnezzar built schools, and built and restored temples. 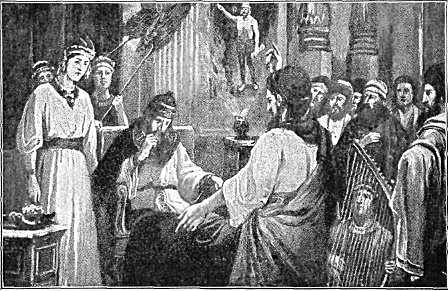 Nebuchadnezzar’s accomplishments are undeniably impressive, including being responsible for modern-day Judaism, and he might’ve been a hopeless romantic who built the legendary Hanging Gardens of Babylon to help his wife deal with her homesickness, for example, but the Book of Daniel in the Old Testament focuses on Nebuchadnezzar’s pride and narcissism (not to mention that pesky business of destroying the temple of Solomon and exiling the Jews), which brings us back to the Halloween aspect–to the werewolf. Nebuchadnezzar is mentioned in several parts of the Bible, but it is in the Book of Daniel that a nightmare and a curse equal something supernatural. Well, pride and narcissism are never characteristics that bring good things to their bearers, especially in the Bible, so it is these flaws that bring on what is conjectured by some scholars to be lycanthropy. 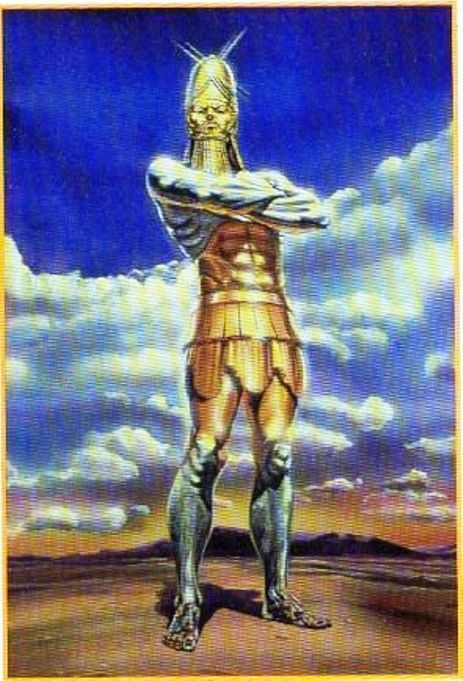 According to the biblical account, Nebuchadnezzar’s troubles begin when he has a nightmare brought onto him by God as punishment for his pride and narcissism. The nightmare features a statue made of various materials; a head of gold, a chest of silver, a midriff of bronze, legs of iron, and feet of iron mixed with pottery (Source). Nebuchadnezzar is troubled enough by this dream that he consults with magicians, sorcerers and conjurers for an interpretation, all to no avail. And this is perhaps where religious tolerance and interest in other faiths is most apparent in Nebuchadnezzar’s world, because he (eventually) asks the prophet Daniel to interpret his dream. And so, after refusing to repent, Nebuchadnezzar is struck by the curse of what is believed to be lycanthropy for the next seven years, and it was like there was a werewolf in Babylon. And after seven long years of living like a beast, Nebuchadnezzar finally repents and recognizes Daniel’s God, after which he returns to his former greatness. Nebuchadnezzar II might’ve suffered from lycanthropy, he might’ve suffered from syphilis, we don’t know. Without archaeological evidence, we cannot be sure that he even suffered from anything other than a common cold here and there. We do know that Nebuchadnezzar II, who the historian Sir Henry Rawlinson labeled “the greatest monarch that Babylon, or perhaps the East generally, ever produced,” died an old man in 605 BC, in the city he made it his life’s mission to make one of the greatest the world would know. We might not have archaeological evidence of a werewolf in Babylon, or the legendary token of love he built for his wife, but we do have archaeological evidence of Nebuchadnezzar’s greatest achievement…Babylon.